LAKEVILLE, IN. 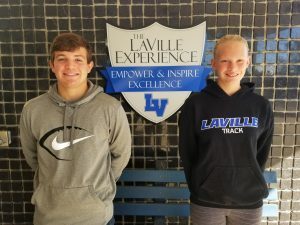 – After nominations from fall head coaches, and an open vote on www.lavilleathletics.com, LaVille cross country runner Faith Rock and LaVille football player Riley Wagoner have been selected September Athlete of the Month. Rock, a freshman, was the Lancers top female runner this fall. She excelled in the Hoosier North Athletic Conference Championships in Winamac, IN., placing in the top 20. Rock ran her personal best 24-minutes, 04-seconds for the 3.1-mile course, taking over three-and-a-half minutes off her early season time. “This was my first year trying cross country,” said Rock. “But I’d say this season went quite smoothly. It was hard to adapt to long distance endurance after playing volleyball for three years instead of cross country. Rock was taken back by being nominated by Coach Ecker for the monthly honor. “It was actually a big surprise,” said Rock. “This was my first year running, and as a freshmen, so I hadn’t even considered this possibility. Wagoner, a senior, plays wing back and linebacker on the 6-3 LaVille football team. Wagoner is one of the captains of football team and leads the team with 80 tackles. He also averages 3.5 yards per carry on offense and has scored three touchdowns. “Our season has gone very well so far,” said the 5-f005-8, 180-pound senior. ” Since the beginning of the season, we have worked hard to grow as a team. Our mindset is to get better each week to reach and exceed our potential as a team.